Can Oakland's Kay Felder succeed in the NBA despite his size? 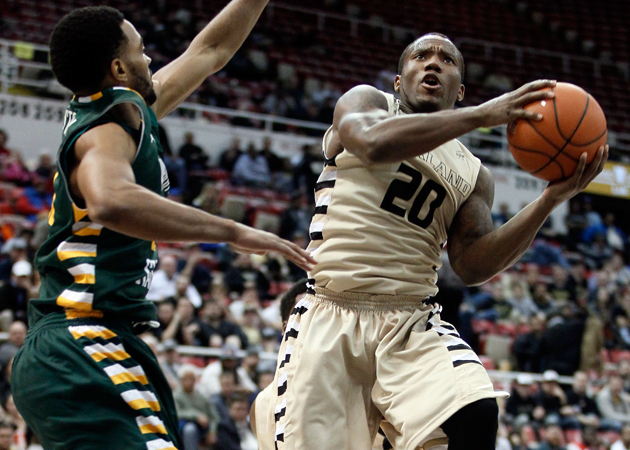 Assessing Oakland guard Kay Felder's NBA potential as the draft approaches. Since 1990, only two players below 5’ 10” have been selected in the NBA draft: Nate Robinson in 2005, and Isaiah Thomas in 2011. Oakland guard Kay Felder believes he deserves to join that group, even though draft experts have him as a second-round pick at best. While a major reason for Felder’s low standing on draft boards is his 5’ 9” frame, he does not mind his size, or lack thereof, one bit. The undersized guard gave up his final year of eligibility at Oakland and with it a chance to become the NCAA’s all-time assist leader and a two-time All-American. He signed with an agent in early April, relinquishing his amateur status. Felder averaged 24.4 points, 9.3 assists and 2.0 steals last season. Among players with at least a 28 percent usage rate, his 120 offensive rating ranked No. 6 in the nation, according to kenpom.com. He led the NCAA with 6.2 offensive win shares. While the numbers are evidence of his scoring ability and court vision, Felder also possesses athletic ability that allows him to get above the rim. Still, his small stature has left him fighting for attention from NBA scouts and executives. Felder has felt slighted before. He received a third team All-America nod, a major accomplishment for a mid-major player. But he was not satisfied, thinking he deserved a first team selection. Now Felder thinks he’s capable of being a successful NBA player. He believes he can sneak into the first round but does not expect to be an immediate star in the NBA, even though he had the ball in his hands nearly every possession during his three years at Oakland. Canada has been through this rodeo before. He worked out with Quincy Acy, an undersized 6’ 7” power forward, before the 2012 draft. Acy was drafted by the Raptors in the second round and has since carved out a career as a role player, starting 29 games and averaging 5.2 points for the Kings this season. Although Acy and Felder play different positions, Canada said there are similarities for any undersized player trying to forge an NBA career. Felder’s potential as an NBA player isn’t inhibited only by his size. He finishes almost exclusively with his left hand around the rim, and his defense has room for improvement, although he partially credits that to carrying such a huge load on offense at Oakland. Felder is perceived as a fierce competitor, a trait that can help him make an NBA roster.